Tax Day is here! We’ve updated this post to reflect new deals that have been announced over the weekend. While it isn’t exactly the new Black Friday, restaurants are offering some pretty great Tax Day deals to celebrate — or is it mourn? Whether that tax return is burning a new hole in your pocket, or if you need a pick-me-up from a very different outcome, check out these awesome deals! If your favorite restaurant or cafe isn’t on this list, be sure to check their social media accounts throughout the day to see if there are any last-minute additions. Enjoy the Applebee’s April drink special, the Strawberry Dollarita with a Twizzler straw, for just $1 all month long. Score a free small frozen yogurt at Bananas Smoothies & Frozen Yogurt on April 15. Available while supplies last. Limit one per customer. BJ’s Restaurant & Brewhouse is celebrating the official end of tax season on Tax Day, April 15 by offering guests Half Off Large Deep Dish or Tavern-Cut Pizzas available Dine In, Take Out or Delivery. April 15will also kick off three weeks offree delivery and no service fee on delivery orders viabjsrestaurants.com(offer ends May 5). Get the $10.40 Tax Day special from April 10 through April 15. The special includes a half-chicken with two sides, cornbread and a regular fountain beverage drink while supplies last. Download the BurgerFi app, and score a $4.15 BurgerFi Cheeseburger on April 15. Get the Big Bagel Bundle (13 New York–style bagels with two tubs of cream cheese) for $10.40 from April 10 through April 15 at Bruegger’s. Just say “1040” to a California Tortilla employee, and you get free chips and queso on Tax Day. Participating Farmer Boys locations will be offering two Breakfast Burritos or two Double Big Cheeseburgers for $10.40 on Tax Day. There is no limit to the promotion and no coupon is required. Score one free Original Turkey or Veggie Dog on April 15. No purchase required. Various Kona Ice locations will be offering free shaved ice on April 15. From now until April 15, customers who visit participating H&R Block locations in New York City and Los Angeles and file their taxes will receive a bag of Lenny & Larry’s delicious The Complete Crunchy Cookies. Offer is good until the cookies run out! Get a free frozen yogurt when you download the Menchie’s app by April 15. From April 10-15, SAJJ is offering $5 off all orders placed through the SAJJ Street Eats app. 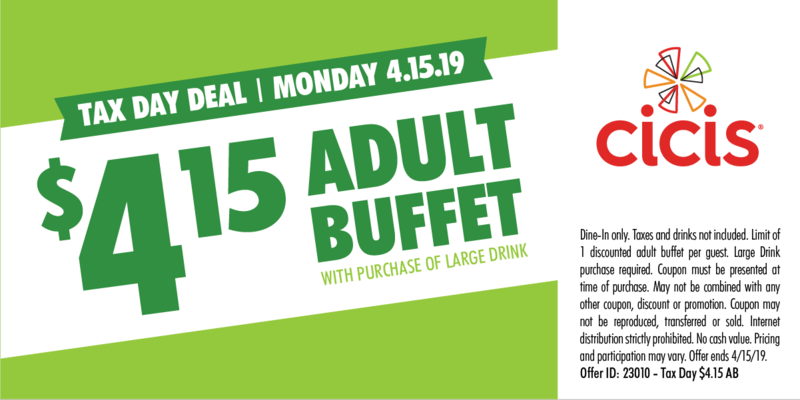 Order a medium drink and chips on April 15, and get The Original sandwich for free on April 15 at participating Schlotzsky’s Bakery Cafe locations. Another great delivery option! New customers get a $25 Seamless credit through April. Download the Smoothie King’s Healthy Rewards app, and score $2 off any 20-ounce smoothie April 15 through April 18. White Castle is offering 15% off any order in-Castle with a coupon, which will be posted on social media pages and sent to email subscribers.